This weekend's Mystery Foto was courtesy of the Detroit Public Library Digital Collections. Driver Louis Chevrolet and his mechanician Joe Nelson. The photo was likely taken when practicing for the race on Ellison Road in Westbury. Check below for the documentation. The #15 Matheson that participated in the 1908 Vanderbilt Cup Race. The racer finished 16th of the17 entries when it cracked a cyclinder in Jericho during the second lap. Congrats to Ariejan Bos, Wayne Carroll Peterson, Greg O. and Robert Greenhaus Frank Femenias and Steve Lucas for correctly identifying the Vanderbilt Cup Race team of Chevrolet and Nelson. Kudos to Ariejan Bos, Wayne Carroll Petersen, Robert Greenhaus and Frank Femenias for further identifying the Matheson that ran in the 1908 Vanderbilt Cup Race. Another photo of Chevrolet and Nelson, likely taken on the same day as our Mystery Foto. 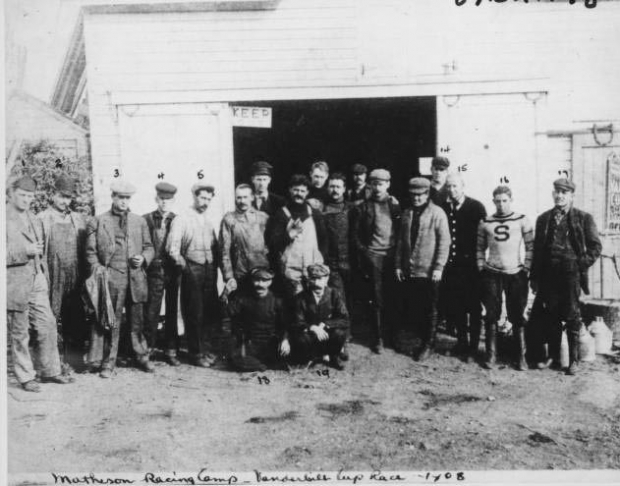 The Matheson Racing Camp for the 1908 Vanderbilt Cup Race. Courtesy of the Hagley Digital Archives. Still another view of our racing team. The automobile to the right in the above photo was not the #7 Matheson (seen here). Can anyone identify this automobile and its likely function? 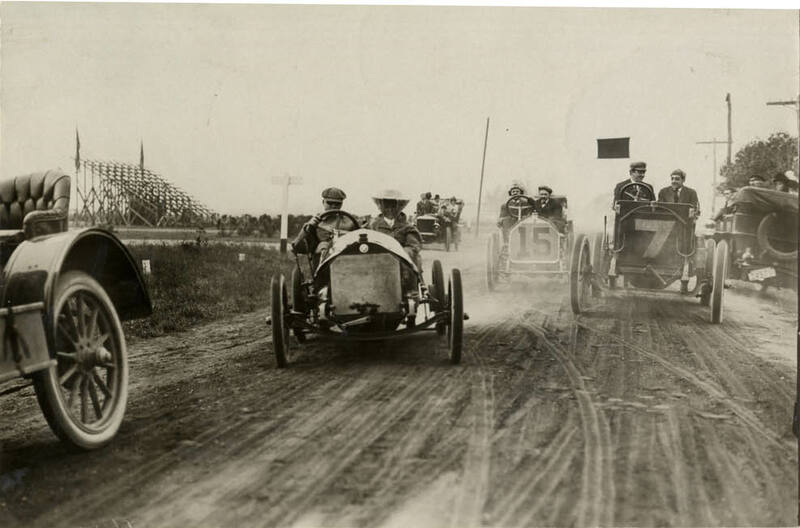 Still another view of our racing team from the Detroit Public Library Digital Collections submitted by Frank Femenias. Again, this photo was likely taken from the same location as our Mystery Foto. Chevrolet and Nelson were clearly getting a feel for the course prior to the race. The temporary grandstand in the background provided a big clue to the location of these photos. 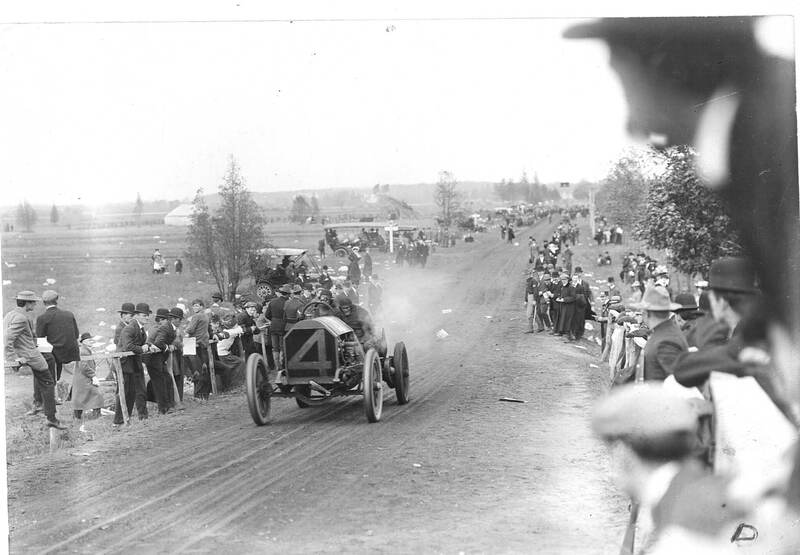 The #4 Chadwick approaching the railroad bridge on Ellison Road in Westbury during the 1908 Vanderbilt Cup Race. A close-up shows the very same temporary grandstand in the background. Conclusion: The Chevrolet/Nelson photos were taken on Ellison Road in Westbury. 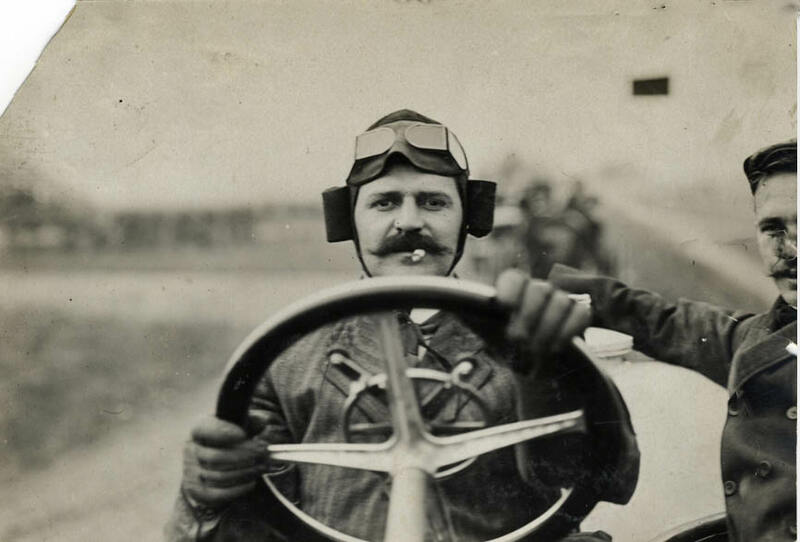 Dont know the mechanician, but the mustache and cigarette belongs to Louis Chevrolet who raced in the 1905 1908 1909 and 1910 Vanderbilt Cup races, i think the racing car was called a darraq. The man with the big moustache is of course Louis Chevrolet. He drove a Matheson in the Vanderbilt Cup races of 1908 with no. 15. On the photo he and his mechanician Joe Nelson are posing on the 90hp Matheson. During the race he already was out in the first round because of a cracked cylinder. It isn’t the car with no. 15 shown on the website by the way. 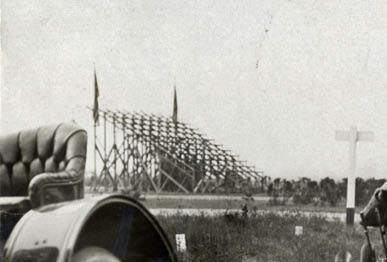 This is in fact the Buick he drove in the 1909 Vanderbilt Cup race (indeed shown there too), coincidentally (?) with the same number. The 1908 lettering style was more square and also the gas tank had a different size. Besides the support for the hand levers is a full circle for the Matheson, but only a semi-circle for the Buick. The only photo of the 1908 Matheson I could find, is the frontal view photo of the Matheson team, with his team mate James Ryall in no. 7. 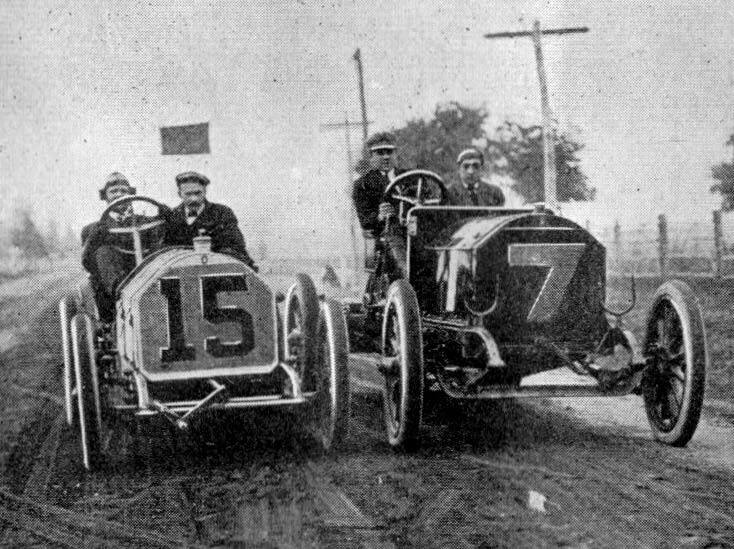 Louis Chevrolet & Joe Nelson, Matheson Racer, 1908 race. Those eyes can only belong to Louis Chevrolet. 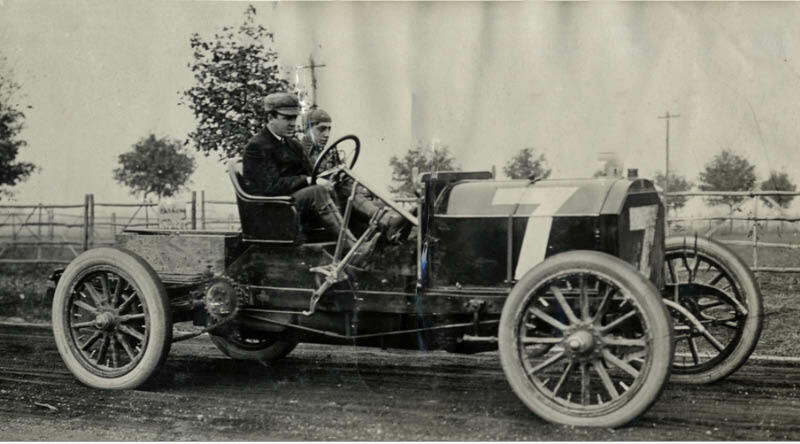 I think he is in his 1909 Buick Marquette racer, which appears from photos to have an enclosed driveshaft, not chain, drive system. I can’t see enough of the mechanic, but it may be his brother Arthur, who joined the Buick racing team with Louis in March of 1909. This car raced successfully in various events, especially in 1909, before The Chevrolets joined Wm Durant and Little in the Chevrolet automobile. When Durant wanted Louis to sanction a cheaper Chevrolet, he left the company, and Durant used the stock he had purchased to help him regain control of GM. The driver is Louis Chevrolet, driving a Chevrolet, or maybe a Peug…..? #15 Matheson, cracked a cylinder on lap 2, finished 16/17 entrants. 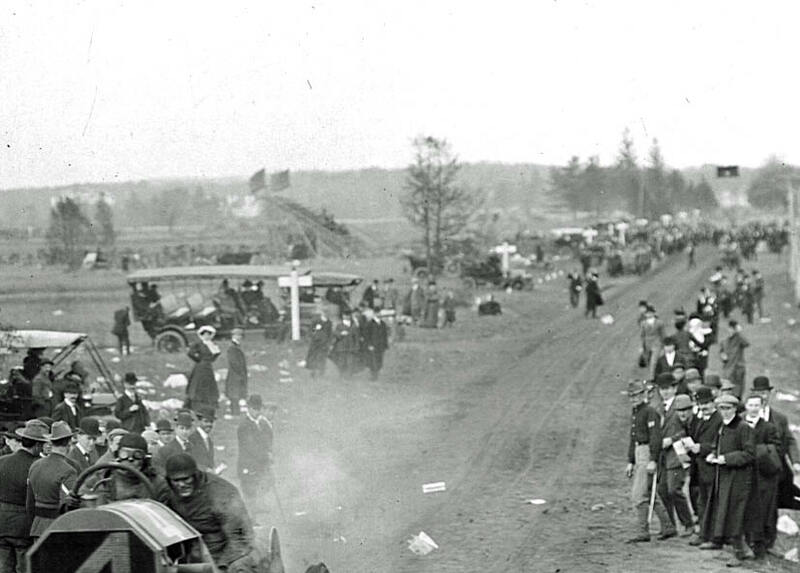 1908 Vanderbilt Cup Race, Long Island. In 1909, the 15 was painted differently. 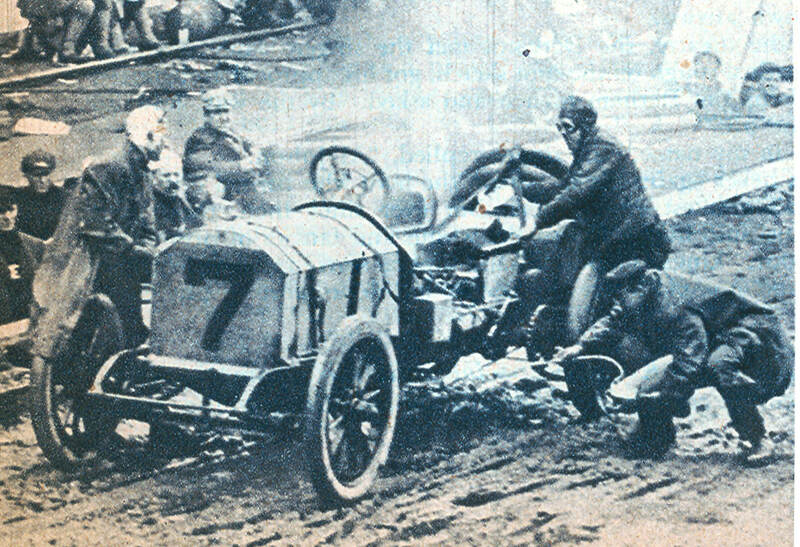 Other Matheson (#7) 60hp, caught fire on lap 4 in front of the grandstand, finished 12/17. 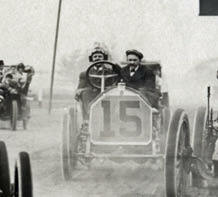 mystery photo #95 is Louis Chevrolet in the #15 Buick, that ran the 1909 Vanderbilt cup race. 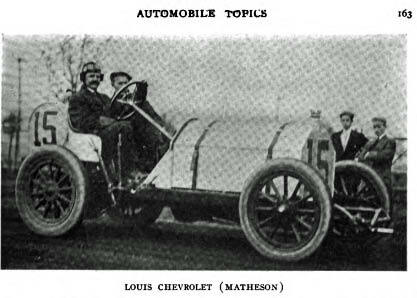 Mystery photo #95 is Louis Chevrolet at the wheel of a Matheson that ran in the 1908 vanderbilt cup race. Well I’m pretty sure that’s Louis Chevrolet and his mechanician Joe Nelson. The tricky part is deciding which Vanderbilt Cup Race the photo is from. It’s either the 1908 or 1909 race since Chevrolet was entered as number 15 in both. The key should be how the number 15 is painted on the tank since the type-style or font is different in both races. However, there is some mis-identification of the racer depending on where you see the photo published. Is it the Matheson from 1908 or the Buick from 1909? I’m going with the Matheson from the 1908 race. Quickly answered this one and fell for the tricky nature of this week’s photo! That’ll teach me for being cavalier and dig deeper even when they seem easy! Eagle-eyed Howard! I didn’t realize the grandstand in the back of the photo with the #4 Chadwick until you mentioned it. (My jaw dropped!) I noticed only the black banner over Ellison Rd. Also the black #7 has a storage compartment in the back instead of spare tires, possibly used for transporting parts for the racer. It has a different shaped firewall as well than that of the racer. The black #7 may not be a Matheson after all. Nice detective work. It is indeed remarkable, that Ryall is at the wheel of a different car on the team photo and the side view photo, than during the race. Ryall’s car on these photos as well as his car during race are higher built cars however. Both no. 7 cars are more or less similar, only the dash seems to be different and on the dark car the tank is missing. Instead there is wooden (tool-? )box, or is it maybe extra weight? Maybe it was a spare car, only used during practice? They resemble the regular Matheson Big Four 50hp of that year, though the chassis seems to be shortened. Chevrolet’s more powerful car is obviously built as a racing car. In Automobile Topics I found a photo of a full side view of no.15, again photographed on the same spot as the other photos. The 6th photo (the DPL-photo submitted by Frank Femenias) is interesting, because the car on the left is a 1908 Isotta-Fraschini type Grand Prix des Voiturettes. It is not the car used in Vanderbilt Cup of course, because this car was much smaller. The touring car in the background is more difficult to id, but could be a 1907 Jackson. Howard - considering the mistake I made, how did I do, did I have the right driver, mechanician, car, car#, race and lastly the other things I added, I’d like to know, whenever you get a chance. Thanks. I hope I’m not asking too much, am I? Your first guess of Louis Chevrolet was correct. Your information on the Tracy/Poole team was good.